Athletic Propulsion Labs (APL) are no strangers to performance footwear, but this past June, they got into the running game with a handful of new models including the APL TechLoom Pro. 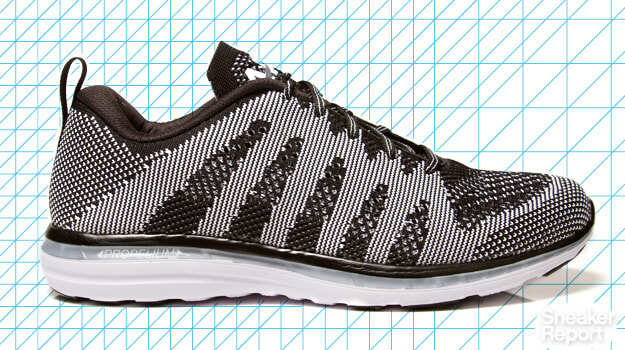 Although the knitted upper may look familiar, the APL TechLoom Pro is equipped with enough tech to stand on its own. For starters, the seamless TechLoom upper features a unique pattern and completely seamless design. The single piece design is engineered to balance strength and flex in the areas runners need it, ensuring that the material is durable enough while remaining lightweight and pliable. The midsole and outsole of the APL TechLoom Pro are combined to allow for a closer to the ground feel and eliminate the need for extra rubber that could otherwise weigh the shoe down. The APL TechLoom Pro&apos;s midsole makes use of Propelium technology, which is most noticeable in the heel area and delivers energy return while maintaining its structural integrity longer than traditional EVA foams. This means they&apos;ll be able to take a beating on the pavement, and you&apos;ll still get quality results months down the line. Finally, the minimally designed outsole is inspired by a feather and makes use of grooves that react to the foot&apos;s movements. As an added bonus, the APL TechLoom Pro is a great crossover casual option. Just ask Kim Kardashian. Best for: Runners looking to try something new yet familiar, delivered by the same brand whose basketball kicks were too much for the NBA. The knitted pattern is similar to what you&apos;ve seen from other brands, but there&apos;s enough going on here to separate it from the pack.